So onward an upward to this information and fun news for you! Website updates: Here in the next couple of weeks we will be doing website updates. When this start or just before it the Founder AOBLXIX will make a post about it in the Community News forum section which you can find there at this link--->(CLICK ME) He will go over everything in the topic of what will be changing an so forth. Please keep in mind that when we do start the updates access to our site will be limited at times an or unable to access it while we work on it. But rest assured you can always join us on discord to stay up to date on it an our gaming sections. First and foremost The recruitment team would like to thank you for being with ADK in the form of either a guest or a member. Our team since the last update has reworked how we review possible applications and made it a little easier to join the ADK ranks as well as added a few new faces and returning faces to the team. Whether you're a guest or a member we do highly encourage you to post on new introduction posts to help new potential members feel welcome here. Plus it's a good way to break the ice if someone plays the same games as you. Enjoy your time here and make sure to welcome any new face you see in discord and on the forums! Be sure to join us on Discord! There are lots of members and games to play, and fun to be had! Click HERE! The Discord Admin group is still looking for members interested in joining our ranks! If you've been a member for a while and are active on the Discord and feel like you can make a positive influence on the community - Click HERE! Now with that said let get to the Section Game updates & Information! Hi from the ADK ARK Staff! As of right now ARK is set to release on PC on August 31st! We are super excited and hope that you guys will come check out the severs now that the game will be fully released. We have opened up a new server for our players. This server will not be part of the hive and will be centered around building to your hearts content! in its incomplete state, the map is massive and gorgeous! We cant wait for the scorched section of the map to be released and see how it effects the players on the map! Feel free to reach out to the ARK staff if you have any questions! Bye for now! The ARMA 3 Exile Server has now being going strong nearly 2 years. We have a committed bunch of Admins and Developers that strive to maintain a fair and flawless enjoyment. At the moment we are working on the server and hope to bring it back up with in a few weeks. or search for ADK in the server browser. we are also in need of new and old admins to help us out in populating the server and keep it clean if you are interested please fill out the admin application. We Would Love To Have You On Our Staff! We have opened up a GunGame Reverse Turbo Server. We are happy to have the section back and the Staff are working really hard to make the section great again! Come hang out, play some games and make some friends within the community! We are going to be hosting weekly in-houses on Saturday nights at 7pm CST! Right now we are a fairly small crowd but we do want to expand and grow to eventually play competitive with each other and potentially open up some new servers. We made the current server GunGame because that is what we (the current staff) know, we are looking for input and ideas on what kind of server you want to play. What type of game mode would get you involved?! We encourage anyone who has input or ideas to post them! We want to know what the people want! Lastly, the CS:GO section is currently recruiting members and Staff for the section! If you have questions please feel free to message @FeistyTV or any of the other CS:GO staff. If you are interested in joining the team please fill out an application! The Operation is in full swing, with 3 systems taken care of we need your support to finish the job. Our Current target is Ceos and Sothis. Feel Free to discuss the Operation in the post I made when it first started several weeks ago. If you have not played H1Z1 in a while you have missed a lot. New Building System, New Strongholds, New Map, New Items..... and more. Once the Test updates get pushed to live we will be pushing hard to populate our server. If you would like to join us make sure to get your application in. If you have any questions regarding either the Test Server or our Whitelisted Server, please reach out to @CaGregorio either on our forums or on Discord. Hi, and welcome to the ADK League of Legends Section! Thanks, and hope to see you summoners soon! Hi from the Minecraft Staff!! We are pleased to announce our Survival/Skyblock (Vanilla) server is now on 1.12 The World of Colors Update! We also host an FTB Beyond Server and FTB Skyfactory 3! Our minigames server is coming soon! Here are some links for your convenience!! creeper.ca.adkgamers.com:25565 This is the link for our hub server which will let you connect to any of our game servers for Minecraft.. However if your playing FTB you need that launcher and if you're playing vanilla you will need to use the standard MC launcher.. Thanks again for all the continued support for ADK and its Minecraft Servers! The Overwatch Section has been growing steadily over the past year. Thank you to all those who have joined us for games and helped to expand our section. For those of you who have yet to play with us, please join us on both the forums and discord to get some games going with us! Our Overwatch section works to include everyone, regardless of skill level. Throughout the year we feature several new events, as well as create our own tournaments. If you want to keep up to date with what our section is doing, please visit our forum section HERE. We hope to play with you soon! Every Friday night the Overwatch section runs an inhouse event! This event begins at 9 PM EST/8 PM CST. We welcome all skill levels to come participate in this event. The night begins with a fun gamemode that has been selected by our users on the forums, and then we later move to playing 6v6 Competitive style matches with each other. This event is a fantastic way to meet people and make new friends! If you have any questions, please contact an Overwatch staff member. Doomfist is the latest hero added to the roster! He's the 8th Offense hero to be part of Overwatch. His release has been hyped up for months, even before Orisa's announcement! As of July 27th, we are finally able to play him on the live servers. Join us in the Overwatch section to bring "Doom" upon our enemies! If you'd like to know more about Doomfist, as well as the patch that came with him, please check out this article HERE! The Summer Games event for Overwatch is returning! From August 8th-28th, the event we all loved to participate in last year will be returning! We will be in the Overwatch section of discord playing this event all throughout the summer. Please join us for some fun in the sun! If you want to read more about this event, please check out an article we have HERE! Hello to you and welcome to <ADK Gamers> - World of Warcraft style. The ADK WoW section has only just started out once again in July after a beautiful revamp - Our sole focus is bringing the fun back into the game and enjoying everything from questing, dungeons and more! We have decided not to focus solely on end game raiding as we realize that not everyone has the same schedule and we are going for that more casual feel. We are active on both the forums and discord there will always be someone for you to ask questions or even just have a friendly chat with. Our focus is you, so why not come and find out more! All server information and admins of the WoW section can be found here. Never tried WoW - Get it for free here. Thank you for taking the time to read this and I really hope to see you soon both on discord and in-game. Have a great day! WOW that was a lot of information for you!! We do hope that this helps you with what each game section is an will be doing. If you have any questions about any said section you can make a post on said games forums section an or join us in discord an message said staff for help an questions. If you have any question about anything else you can message @CaGregorio or @Dowin any they will be more then happy to help you out. 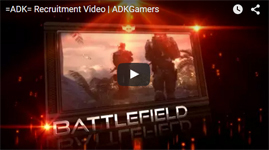 We want to thank you for being part of the =ADK= Gaming Community whether as a registered user or an =ADK= Member. We are here because of you an we again like that you have chosen us as your home to play at.